We hit up the Health and Beauty Aisle at Kroger to see what goods we could find. We liked that the generics we picked up were close to or exactly $2.00 less than their name brand counterparts. If you make the switch on several products, that's a significant savings! We think you will find some winners in the bunch. Brandefy compares store brands (e.g., K Care) to name brands (e.g., St. Ives) to show you when the generic is as good as the name brand, and to warn you when it is not. Our goal is to help you save time and money, and to have a good time while doing it. We will start with Sensodyne Extra Whitening toothpaste, which had a respectable similarity score. The Kroger Sensitive Toothpaste Plus Whitening scored an overall similarity score of 82%. The ingredient panels are 88% similar, and the active ingredients are very similar. Both cleaned our teeth effectively and had a similar consistency. The packaging makes the toothpastes' consistency slightly different because the Kroger toothpaste has a more narrow tube than the Sensodyne, so less comes out per squeeze. Perhaps the difference that will matter most to consumers is the minty-ness. Sensodyne is much more minty than Kroger, so the brushing feels fresher. We still may make the switch because both toothpastes get the job done, but you will want to consider this when making your purchase. These toothpastes are 82% similar, but the name brand is more minty. The next two products were real winners. 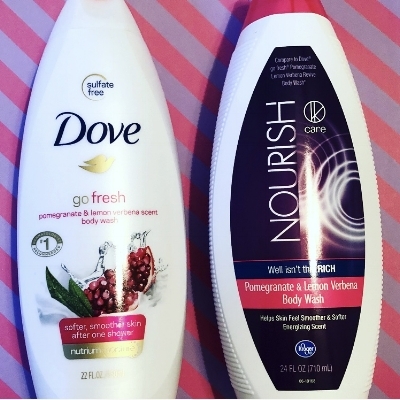 The K Care Nourish Body Wash in pomegranate with lemon verbena does a nice job of copying Dove Go Fresh. Both have are alike in smell and color. The ingredient panels are 87% similar, and they both are smooth and give a nice wash. We did notice that the Kroger wash does not sud up quite as well as the Dove, though that did not bother us too much. We gave this one an overall similarity rating of 88%. We are switching to save here. Our final product, was one of the best dupes of St. Ives Apricot Scrub we have found. We grabbed the K Care version of St. Ives Acne Control Scrub. Both of these washes smelled like apricot, and had a similar tan color. They had the same level of "scrub factor" and left our faces smooth and clean. The overall ingredient panels are 83% similar, but have nearly identical active ingredients, so we feel confident about the effectiveness of the acne control. We are definitely making the switch on this one. We have learned from this whole experience that Kroger is for more than just food. We'll be exploring more in posts to come!